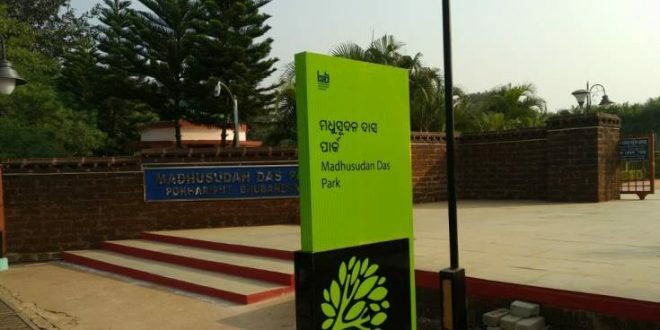 Bhubaneswar: Seven major city parks under the Bhubaneswar Development Authority (BDA) have got a new look with magnificent and meaningfully designed signage. The seven city parks with signage and way findings by BDA include Indira Gandhi Park, Biju Patnaik Park, Madhusudan Das Park, Buddha Jayanti Park, Kharavel Park, Shyama Prasad Mukherjee Park and Mahatma Gandhi Park. Signage and way findings had previously been executed in three smart parks in the smart city district. In simple terms, way findings are referred to the systems that are employed to help tourists and visitors orient their position and get to their desired location, said an official. Once properly implemented, the signage will help the tourists determine where they are, designate the route they should take, reassure them that they are following the correct route once they have committed, and finally, they should confirm arrival at the desired destination once it has been reached. They will help visitors navigate the course to their desired location while setting their minds at ease. They would help the users find basic facilities and points of interest inside the park, on their own. The wayfinding plan implemented in Bhubaneswar city parks aims to make the parks of Bhubaneswar easily navigable within and provide information to connect the parks to the cultural assets all around. The map signage informs the visitors of all significant points of interest such as attractions, toilets, drinking water and pathways. Entry signage will indicate entrances for both abled and specially-abled persons. A comprehensive caution signage at each of the gate of the parks with dos and don’ts for the park premises is also added. Each point of interest has been provided with signage to indicate its presence. The way-findings are efforts of city planners and they have brought a new level of convenience to tourism by creating step-by-step guides to parks, points of interest and other “must-see” locations. “The signages in the Madhusudan Das Park near Pokhariput have given a new trendy and international look to our park. As a morning walker and an office-bearer of a resident welfare association nearby, I feel proud to be part of the city, which has changed itself a lot for and during the World Cup Hockey,” said Nrupakishore Patnaik, president of Resident Welfare Association, Kalunanda Nagar, Pokhariput.